The Narendra Modi government has presided over the weakening of several important institutions, including the council of ministers and RBI. On the surface, it might appear to be paradoxical that while Prime Minister Narendra Modi once declared that the Constitution is a “holy book”, his government has presided over the weakening of several important institutions: the Council of Ministers is now fully subordinate to the PMO, and once relatively independent RBI, Central Information Commission and Election Commission have been weakened, not to mention the further deterioration of the CBI and CVC. Furthermore, in many cases — for instance during the formation of the government in Goa and Karnataka — what governors did was quite different from what the Constitution required them to do. How is it that on the one hand we say the Constitution is our holy book, and on the other hand increasingly violate its letter and spirit? Because, first of all, it is wrong to declare the Constitution of India a “holy book”. Second, the idea of a “holy book” is foreign to India’s largely Hindu culture. Finally, in India, symbolism is frequently used as a substitute for the substantial. A holy book is generally a statement of the will and the words of God. It cannot be changed by human beings. That is why, in Judaism, Christianity and Islamists, fundamentalists want people to adhere as close to the literal words in their holy books. The word of God cannot be wrong, and hence cannot be challenged. Those who challenge it are challenging God and hence deserve punishment. Needless to say, the “correct” way to live is to live strictly in accordance to what is set down in the holy book. Now, whether in the present or in the past, not all Jews, Christians and Muslims exactly followed what their books required them to. But still, it is the book that sets the benchmark to determine the extent of what is correct or wrong for the adherents to do. The historical path taken by the followers of these three Semitic religions has been different, and today a lot more Christians are able legitimately to deviate from what the Bible says, than their Muslim counterparts. 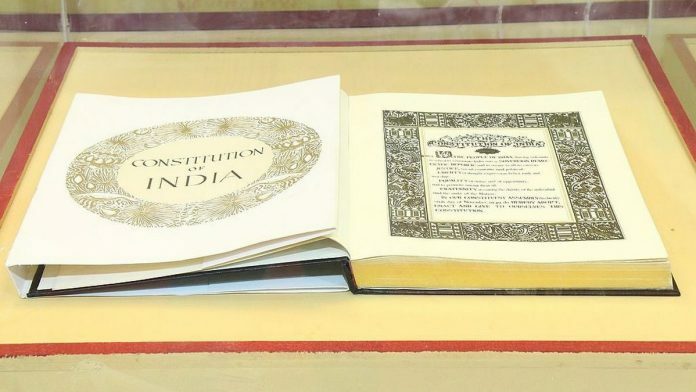 The Constitution of India is very different from the Old Testament, the Bible and the Koran. It is not divine, but a very human document. It makes no claims to perfection. Rather, it admits to its imperfections, to its compromises and therefore allows itself to be amended. It can be wrong, it can be out of date and it can be challenged. The people of India, through their elected representatives, can amend most of it except the basic structure, and the Supreme Court of India can interpret it. It doesn’t tell us of a correct way to live, but rather defines the rights, responsibilities and duties of citizens and the state. Instead of centralising power in an almighty God, it divides power among fallible humans. The Constitution is, ultimately, a product of Reason and a framework for us to conduct our affairs using Reason. Other than Sikhism, no religion that originated in India has a “holy book” or requires one. It was only when Hindus came into contact with Muslims and Christians that they felt the need for a holy book too. Some felt that the Bhagavad Gita is the Hindu holy book. Swami Vivekananda declared that “the Upanishads are the Bible of India. They occupy the same place as the New Testament does”. There are yet others that accord the status of the holy book to the Vedas. Yet, it is possible to be a devout Hindu without ever having read a sentence from any of these books! In fact, it is unlikely that a majority of Hindus — and Buddhists and Jains — have ever read more than a small fraction of their religious scriptures. How to live a good life, how to pray, what religious rituals to practice, what is right and wrong comes from a variety of traditions, practices and social norms rather than out of a book. In other words, a holy book is not essential for adherents of Indian religions to go about their life. Only the Sikhs are a little different in this respect, in that they consider the Granth Sahib their Guru, and perhaps because their religion originated after the subcontinent had centuries of experience of Islam. In any case, most Indians have very relaxed attitude towards their so-called “holy book”. Perhaps as a result, we have a relaxed attitude towards our Constitution too. We can respect the book and what it says, but act according to what other people do. This brings us to the third point. Just as we symbolically worship women as goddesses, and symbolically elect them as political leaders, while subordinating them in day-to-day life, we symbolically worship the Constitution while violating it in practice. Further, every year we celebrate Republic Day on 26 January without even knowing its significance. The military parade in New Delhi and similar parades in state capitals seem to be what it is all about. Far from being an occasion to pay our respects to the defence forces, Republic Day is when we celebrate the coming into force of our Constitution. More recently we have started commemorating 26 November as Constitution Day or Law Day. Will this prove any less symbolic than Republic Day? A holy book demands to be worshipped. The Constitution merely requires us to respect it. In fact, it would be against the spirit of the Constitution to worship it! To respect the Constitution would be to act according to its letter and spirit. For constitutional authorities to respect their duties and play their proper role; to not overstep their boundaries; to refuse to be coerced by political considerations; to strengthen institutions and conduct public discourse with civility and decorum. The author is director of the Takshashila Institution, an independent centre for research and education in public policy. The Constitution, Ram Rajya, Raj Dharma. That is the way public affairs should be ordered, one that is fair, just, impartial, inures to the public good. No one who has seen that video clip of an elderly woman wailing, supplicating before a PSI, who remains seated arrogantly – where else but in Mahantji’s Uttar Pradesh – would buy into the claim that the Constitution is our Holy Book, which we worship. This is how the grime of anti incumbency accumulates. Then one day the humblest citizens exclaim, Enough is enough.